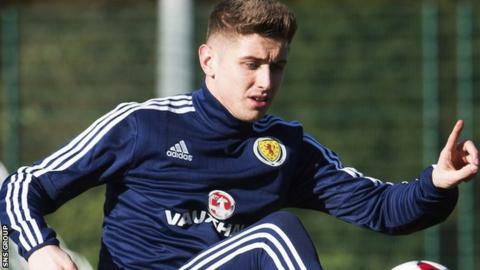 Tom Cairney says he and his family have waited a long time for him to make his Scotland debut and he aims to hold on to his place should he face Canada. The 26-year-old believes he is in the best form of his career after being switched to a central midfield role by Fulham head coach Slavisa Jokanovic. "I have wanted it for a long time now and it is great to finally be here," said Cairney. "I don't want to just be a flash in the pan. Once I am in, I want to stay in." Cairney, who has played at under-21 level, is hoping to make his full debut in Wednesday's Easter Road friendly, which is preparation for Sunday's World Cup qualifier against Slovenia at Hampden Park. "I thought it would happen at some stage," he said about his first call-up to Gordon Strachan's squad. "But, when it eventually happens, no matter how the season has gone, it is still surprising. "I have never had a season like I've had and I owe a lot to the manager and the staff for that as well." Cairney believes his international progress was hampered by being played out of position with his English Championship club. "A few managers over the last couple of seasons have played me on the right wing," he explained. "I can play there, but I never felt that was my strongest position. "I have been playing in the middle of a three and it's more natural to my game and that's a big factor in my form this season and I've enjoyed it a lot." Cairney was born in Nottingham but retains strong links north of the border through his Scottish father. "I used to come up every school half term and visit my family in Uddingston," he recalled. "I used to get my Celtic kits and stuff. I had good memories when I was little. "It makes it a lot harder to come up these days with football and being in London, but I have very good times here. "My dad especially is a big Scotland fan, so I think as soon as I got called up it was a proud moment for him." Cairney recognises that midfield is where Scotland have greatest strength in depth and it is where he will compete for a starting place with his former under-21 team-mate, Stuart Armstrong, who is also in seeking a first cap. Strachan has decided that Armstrong, along with four Celtic colleagues, will not feature against Canada after playing for their club on Sunday. Injuries to James McArthur, James Morrison and Matt Phillips further increase the chances of a first cap for Cairney, who the national coach praised for his nine goals in 41 appearances this season. "Tom Cairney has been absolutely fantastic this year," said Strachan. "He could probably be the midfield player of the year in that league. "In saying that, Matt Ritchie's scored 13 goals for Newcastle, so he's been magnificent and Stuart has been fantastic as well."